June 9, 2018, Sussex County NJ – As an exclusive title that is bestowed upon a select group each year, Andover Township’s own TAYLOR PHILHOWER from ULTIMA HAIR DESIGNERS recently excelled into the elite group of Redken Certified Haircolorists, bringing superior coloring service and expertise to the area with an added modern twist. Redken Certified Colorists study under the industry’s leading professionals and trendsetters to ultimately introduce their own clients to the latest color trends and techniques. The certification is received after undergoing a lengthy, rigorous test process, and those who excel into this leading group receive immediate industry acclamations and recognition for their coloring expertise. Ultima hair designers salon and spa is proud to announce and welcome Alyson Sandman has a new hairstylist and nail technician to Our team! With over 20 years experience In cosmetology Alyson can fulfill all of your beauty needs in one stop. She has trained with Tammy Taylor nails out of Orlando Florida as well as Redken fifth Avenue. 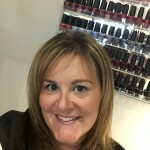 Alyson is trained in the latest trends such as balayage, and ombré hair color techniques, as well as cutting and styling. She also can take care of any of your nail requests. She specializes in all aspect of acrylic nail services as well as natural nail care. She will even go as far as to custom blend colors for that perfect pink and white French look! Alyson is a all around trained artist and one stop for all of your beauty needs! Ultima hair designers salon and spa looks forward to Alyson’s experiences & talent servicing you and a fabulous future with Ultima! 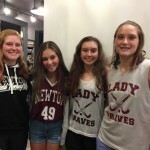 October 9, 2018 … 45 young ladies from #NewtonGirlsFieldHockeyTeam donated their time and money to #BreastCancerAwarenessMonth at #UltimaSalonAndSpa!! These young ladies all received #PinkHairExtensions and even a few decided to use pink hair color in their hair! We love these girls for the special girls they are!!!! Also thank you Carrie Perentin Docherty, their team leader for organizing and being such a great leader to these sweet young ladies! also big thank you to our Nichole Hofmann, Alyson Joy and Krista Elizabeth , Ultima’s designers for being part of this awesome event!! Kaylynn Moshier and Alexis Perch sharpened their professional edge and took their hair styling and coloring talent to the next level at the award-winning Redken Exchange in New York City. 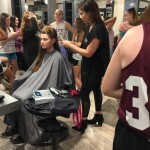 Kaylynn Moshier and Alexis Perch were some of the dedicated professionals, who attended classes at The Redken Exchange, the hair industry’s leading resource for higher learning, and now brings you fresh and exciting salon services. Along with stylists from around the globe, Kaylynn Moshier and Alexis Perch learned advanced techniques in hair design and haircolor from leading experts in the salon industry, bringing you the latest in wearable fashion hair trends. The Redken Exchange is the award-winning, leading resource for higher learning in the professional salon industry, and allowed Kaylynn Moshier and Alexis Perch to experience interactive, hands-on attention. 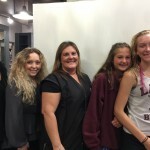 Kaylynn Moshier completed Cut and Know Why, Alexis Perch completed Everything’s Included and they received Certificates of Achievement, as well as the latest information on Redken haircare, haircolor and styling products. Consumers interested in fresh, modern, innovative style or color can call Kaylynn Moshier or Alexis Perch at 973.579.1199 to make an appointment. Salon professionals can visit www.redkensalon.com or call 1.800.545.8157 for more information regarding classes at The Redken Exchange. Susan Lynch sharpened her professional edge and took her hair styling and coloring talent to the next level at the award-winning Redken Exchange in New York City. 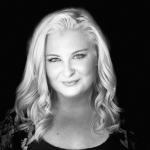 Susan Lynch was one of the dedicated professionals, who attended classes at The Redken Exchange, the hair industry’s leading resource for higher learning, and now brings you fresh and exciting salon services. Along with stylists from around the globe, Susan Lynch learned advanced techniques in hair design and haircolor from leading experts in the salon industry, bringing you the latest in wearable fashion hair trends. The Redken Exchange is the award-winning, leading resource for higher learning in the professional salon industry, and allowed Susan Lynch to experience interactive, hands-on attention. Susan Lynch completed On With the Shows and she received her Certificate of Achievement, as well as the latest information on Redken haircare, haircolor and styling products. Consumers interested in fresh, modern, innovative style or color can call Susan Lynch at 973.579.1199 to make an appointment. Salon professionals can visit www.redkensalon.com or call 1.800.545.8157 for more information regarding classes at The Redken Exchange.